Melbourne Wet Smartphone? PINGI Moisture Absorbers are the answer. Four seasons in one day. Melbourne weather does present a challenge from time to time. Our Smartphones will also be part of that surprise downpour from time to time. Smartphones hate moisture of any kind. In Brisbane it could be the humidity and in Melbourne it can be unexpected rain. You may not think much of it at the time but your damp phone may well lose functionality over time because of an innocuous moisture related incident. Common customer feedback comes from activities like taking the phone for a swim, Facebook on the toilet or cleaning your Smartphone in the washing machine. Much less subtle water damage. You may be thinking of using some rice, the hair dryer or even giving the microwave a go. Insurance against a Wet Smartphone. Our Melbourne Wet Smartphone Moisture Absorbers are the best products for the job. The Moisture Absorber should be bought before you have issues with your smartphone. Why not insure yourself against a Melbourne Wet Smartphone? We recommend that you buy a PINGI XL 450gram Moisture Absorber which you can also use to keep clothing in cupboards dry. 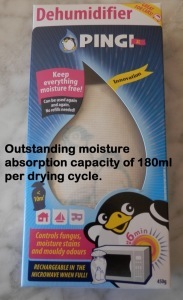 This product can absorb up to 180ml of moisture per drying cycle. Once saturated, simply pop the PINGI in the microwave oven and it will be ready to use again. RadioShack gives good advice on the subject of wet smartphones. The moment you realise your Smartphone is wet, is the time to do something. Whatever you do, do not try to switch it on! Switch it off if at all possible. Remove the battery and sim card (if possible) of the smart phone. Dry the battery, sim and the external parts of the device with a towel. Take a plastic bag or container that you can close (snap lock bags are best). The bag/container has to be big enough for the Melbourne Wet Phone Moisture Absorber. Put all parts of the smart phone together with a PINGI XL 450g moisture absorber into the bag. Leave the parts in the bag or container for around 48 hours to dry. Then put the phone together again. There are no guarantees of perfect restoration once electronics are exposed to water. Our PINGI XL Melbourne Wet Smartphone Moisture Absorber will give your phone a great chance of working again. What is more, you can use it elsewhere in your home. Note that if your phone is beyond repair, there is a Melbourne company (Mobile Monster) that will buy damaged smartphones from you. Go to our shop and order your PINGI XL today.